It is located in Navarra, 8 kilometers from Sangüesa and 53 kilometers from Pamplona. It is another place that you must visit if you are in Navarra. The place where it is located is wonderful and its architecture is another example of Navarra’s history. 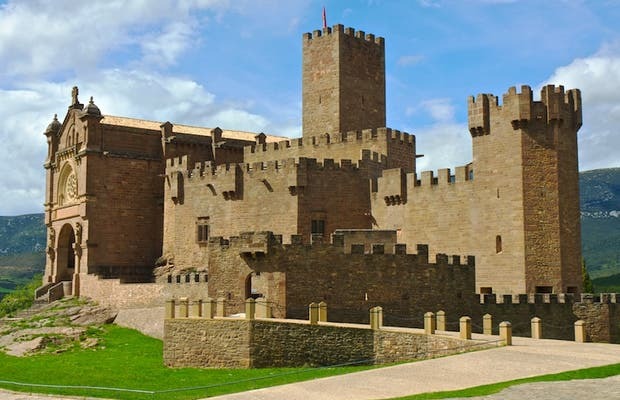 We went there on a Saturday morning and it was very calm, so we could visit it peacefully and enjoy the view of the castle-museum and learn a bit more of the life of the patron saint of Navarra. The next thing on the list is to enjoy the “Javeriada”, the first two weekends of March. We were on our way to Huesca when we realized we were next to the Javier Castle, so we couldn’t resist making a stop. We had heard a lot about the place. There was a lot of peace and calm in the place, with barely a few cars in the parking lot. On the right side there is a statue of the saint, and on the left side an avenue lined with trees that takes you to the castle. We started walking, everything was perfect. We saw a cafeteria, a souvenir shop, and toilets. At the end of the avenue there is an esplanade paved with slabs of stone. On one side there is a mosaic of the saint, in front of the castle. Next to the mosaic there is a convent from the 16th century. It is quite austere but I could enter the central patio, which is in perfect condition. In the highest point of the little town of Javier you will find the Javier Castle, home of the venerated patron saint of Navarra, San Francisco Javier. The castle is from the 10th century. A tower was built first, due to its strategic location between Navarra and Aragón. Then the rest of the castle was constructed. The fortress suffered the vicissitudes of history, especially in 1516, when it was partially destroyed. By the end of the 19th century the basilica of Javier was built. In 1952 the reconstruction that gave the castle its original physiognomy began. San Francisco Javier was born in a noble family in 1506, he was a Jesuit missionary and died in China after traveling in Africa and Asia.